Bionic Briana: the 4th trimester. We are almost done buying things for the wee-one. We are trying really hard not to accumulate stuff but rather get what we think we need now (crib, car seat, stroller) and then buy things we realize we need after she is born. A definite need on our list was a baby carrier. 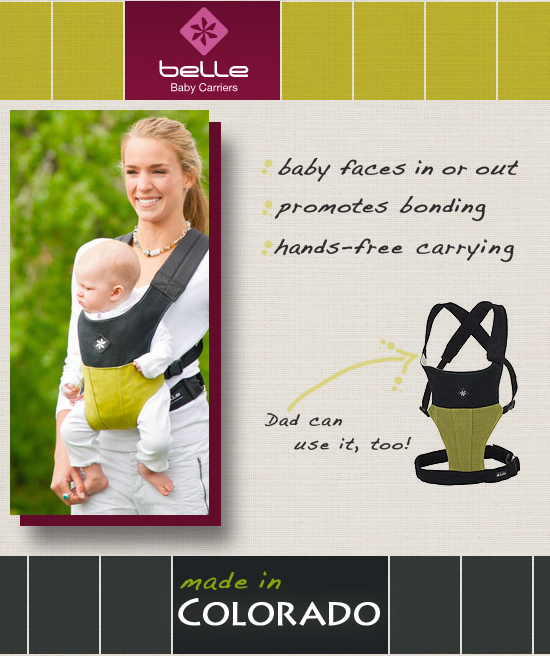 I found this one from Belle that received high marks in the Baby Bargains book and it is made right here in the U.S.A. There is a ton of information on Belle's website about the benefits of using a baby carrier right after the baby is born and for the first few weeks during what is known as the 4th trimester. Rather than reiterate what they say, you can read more about it here. Very interesting! Have you heard of the 4th trimester? Did you use a baby carrier? My sister actually worked for The Happiest Baby and Dr Harvey Karp so I had heard a lot about the theory of the 4th trimester. It makes a lot of sense. And the baby carrier seems like a great idea so that if your baby is fussy and wants to be held, you can still get things done around the house while appeasing your little one! My sister LOVED her baby carrier... they were able to be more mobile in Boston, but both my kids didn't not take to fondly of the carrier! It depends on the child, and how often it is used I suppose. I am SO excited to see little one, you have NO idea!! We just used our Ergo for the first time this weekend and Nolan loved it! And my back did too. I also have a Moby but it's a bit trickier to get just right. I love happiest baby on the block. Our little one loves to be swaddled and shushed.